Planning a baby shower? Trying to think of some fun & easy games to play? Then you’re sure to love this nursery rhyme game – charades! It’s a great way to get guests interacting and it’s sure to lead to laughter! This free printable charades game is filled with nursery rhymes and children’s songs. For more fun Nursery Rhyme Baby Shower ideas – check out this post with everything from invitations & food through to party favor tag ideas! Have you played charades before? It’s really easy to play. 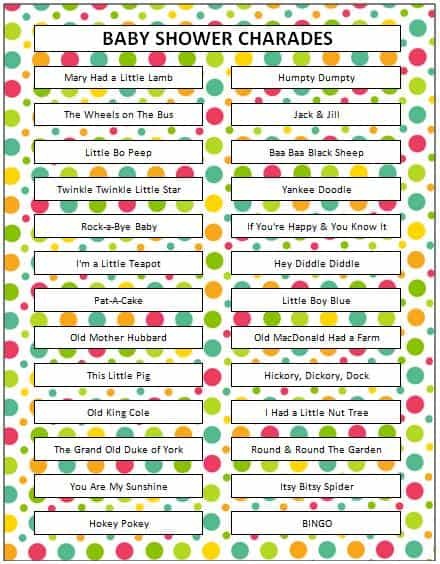 Simply print this free printable nursery rhyme game (click here to print the free printable) and cut out the charades. Place the charades into a bucket. You’ll separate the group into two teams. Team A will choose an actor and that person will randomly choose one charade from the bucket. That person will then have one minute to act it out for their team. There is no talking allowed in charades! If Team A guesses the correct answer in one minute, then they win a point. If they don’t guess it correctly, Team B is allowed to take one guess at the correct answer. If they get it right, they get one point. Now Team B takes a turn choosing an actor and guessing on the next charade. The game continues until you run out of charades or until everyone has had a chance to be the actor. How many of these nursery rhymes or children’s songs do you recognize? Can you think of ways to act out this nursery rhyme game? What is your favorite nursery rhyme? Stay updated on the latest party ideas and freebies by following along on Facebook, Twitter, Pinterest and Bloglovin’. What a terrific idea for a baby shower, so much fun to have everyone interacting. Sure to get many, many laughs and will definitely “break the ice”. I have heard of many of these nursery rhymes but not – I Had a Little Nut Tree, The Grand Old Duke of York, Round & Round The Garden and BINGO. you have such creative ideas! I know I am always looking for fun games to play at special occasions such as this.. thanks for sharing! sounds like fun! very whimasical! Great idea!! Old McDonald would be hilarious to act to! !